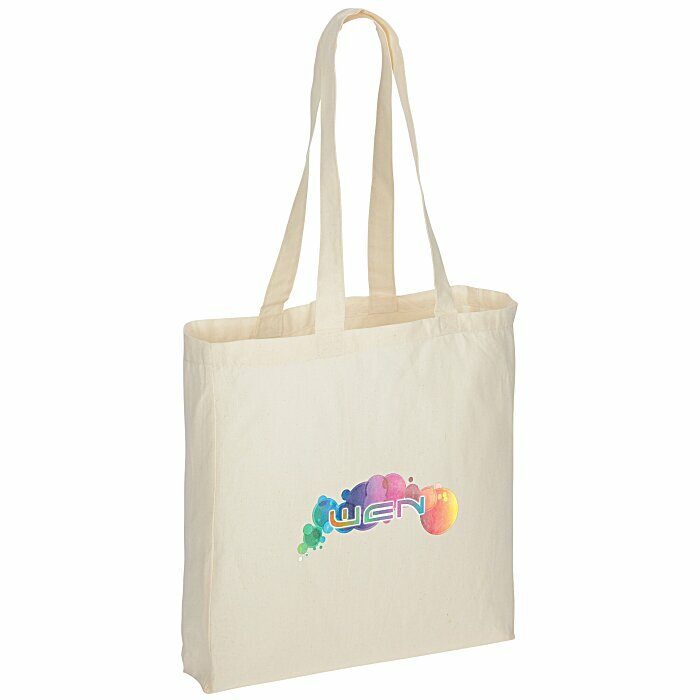 Put your full-color promotion to work with this cotton tote! From donor gifts to imprinted trade show bags, these full color options are made to impress. Quality lightweight cotton sheeting totes are perfect for running errands and grocery shopping because you don’t have to worry about them ripping or breaking. With a 3" gusset, this bag can hold even more! Elongated self-material handles measure 28" long. If you only need a one-color imprint, see item #1922-NGusseted Cotton Sheeting Tote - Natural. For the Gusseted Cotton Sheeting Tote in your choice of vibrant colors, see item #1922-CGusseted Cotton Sheeting Tote - Color. Size: 16" x 15" x 3".